When last I wrote- Wow! It’s been a month ago!- I was on the way to attend “Voices” at Scarritt-Bennett Center in Nashville. I seem to have been going non-stop since then, and have several things to share with you. But, I don’t want to make this so long that you won’t want to read it! So I’ll try to add a little something every other day or so until I get all caught up. I came away even more convinced of the vital role language coordinators could play in our conference UMW. As your president, it is my responsibility to appoint language coordinators. I need your help. I know that there are groups in our conference that speak other languages- Tongan, Spanish, Korean, and French for sure. There may be others as well. Some people have expressed that coordinators are not needed if the ladies also speak English. I disagree. The role of the person is not only to interpret for their group of ladies, but also to communicate their cultural practices, customs and ideas to the leadership team. This will allow us to design our programs in a culturally rich way for everyone involved. The job of the language coordinators would also be to help their groups connect to UMW. They would interpret as needed at meetings, and assist with written interpretation of the newsletter, this blog, and other communication. Even more importantly, the language coordinator would be present at our team leadership meetings to assist the leadership team in understanding our sisters and providing programs and projects that would be meaningful and relevant to them. So, once again, I need your help! Do you know someone who is bilingual in Spanish, Tongan, Korean or French? Are there other language groups in your district? Are there ethnic ministries in your district that we could work with to find coordinators? Please help me connect with all of these women. My goal is to appoint language coordinators- "Voices"- to serve with us before the end of this year. Please call or email me to share your thoughts about this. The next Cross Ties newsletter is in the works. Please watch for it and read about all the exciting opportunities to connect, grow and serve in the coming months. As I write, I’m onboard a Southwest Airlines Boeing 737-800 on my may to Nashville, TN. I’m headed to the Scarritt Bennett Center for “Voices” a national UMW training. I’ll tell you all about it when I get back! Last Saturday, I attended UMCOR’s Early Response Team Training at my home church in Red Oak, along with 9 other members and 2 guests from other churches. Tuesday morning, I took a little road trip to Georgetown. My destination was Wesleyan Independent Living at Estrella. I attended, as your representative, the Board meeting for Wesleyan Homes. For those unfamiliar, Wesleyan homes has 4 campuses in Georgetown and offer services including home health and rehabilitation care, affordable residences for independent living , assisted living, nursing care, memory care and hospice. Their non-profit work is supported by benevolent giving of groups and individuals. Georgianne Hewitt, Vice President for Development, who spoke at our 2016 Annual Autumn Gathering emailed to share this information with me. “Here are the links to the Wesleyan Homes website and social media. We’d love to be linked to the CTCUMW. Also, if you think of any opportunities at which a speaker or panelist is needed, I am always happy to design presentations to a group’s interest and needs. With one of your legislative agenda items being prioritizing quality, affordable healthcare, I would gladly be a resource for advocating for legislation that benefits seniors in Central Texas. We’re watching some potential legislation right now. I hope you’ll visit the links, Follow on Twitter, Friend on Facebook, and consider inviting Georgianne to speak at your District or Local UMW meeting. She has much to share. Wesleyan Homes are planning a grand opening of their newest addition- the East Building-on April 22 at 1:00 PM. If you are able, please attend. When I get home, I'll be putting the finishing touches on my preparations for our Spiritual Growth Retreat next weekend. I look forward to our time together! Happy Valentine's Day! I hope you spent it with someone you love. TCU Wesley has a group of student leaders who are available to come visit UMW to talk about missions and ministry on the TCU Campus. TCU Wesley is the official Methodist ministry on the campus of Texas Christian University. TCU Wesley is also a ministry of the Central Texas Conference of the UMC and is supported by your mission giving. 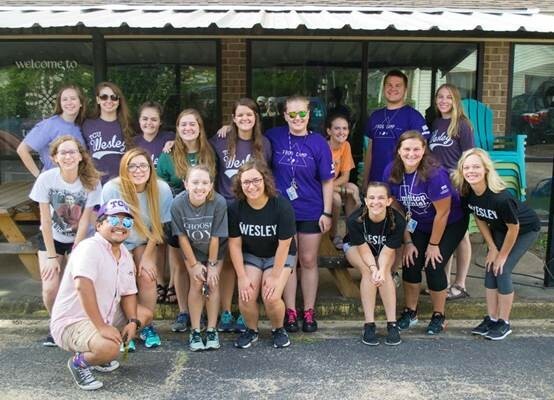 TCU Wesley is active in connecting college students to Christ and community. We have dinner and worship once a week, Bible studies offered nearly every day, and many mission activities, including several mission trips with Casas Por Cristo, where students pair with others to build houses in impoverished areas. We'd love to come thank you in person for your support of our ministries! More information can be found online at tcuwesley.org. Please contact us at tcuwesley@gmail.com for scheduling! My life is a series of calendar events. I was reminded of this yesterday when my husband, a pilot for Southwest Airlines, was working on his schedule bid for March. He asked me to go through my calendar and tell him what I had on it that he needed to consider when bidding. When I got through, he said, “You’re busy.” And I had to agree. But, I wouldn’t know what to do if I wasn’t. Every date on my calendar is representative of a group or cause that I care about deeply enough to give my time. Last Saturday, I had the joy of spending my day at our annual Sing-a-Rainbow. I thank each woman that came to participate and every speaker that shared their cause –with passion and often, heartfelt tears- for the ones they represent and serve. Hearing about the challenges of teenage and single moms, the research being done to improve outcomes for babies and their mothers, and the work being done locally to support, disciple and simply embrace with Christian love women, children, and youth was a blessing. We thank Vicki Berry, from South District, for her music. We thank Ben, from Acton UMW for ably manning the audio-visual booth. He made what could have been a techno-fiasco run very smoothly. And we thank our wonderful Acton UMW for their gracious service as our hostesses. Next up on our Conference UMW calendar is our Spiritual Growth Retreat at Arrowhead Camp and Retreat Center. The planning team is in high gear working on music, mission projects and the message about “Living Water.” Our leader for the retreat, Rev. Debra Crumpton is preparing three sessions for two days that will help us focus on keeping our buckets full of that living water. I hope you will join us. The camp houses about 120. It would be wonderful to fill the bunks! Or call Becky Brown, our registrar at 817-948-3097. Going to the "Big Pink Building"
Sunday I loaded the back of my Ford Edge with a full suitcase, a computer bag stuffed with UMW Resource and Year books, snacks, water, and a silent auction basket and headed down I35E towards Austin. The fact that I experienced NO heavy traffic OR construction cannot go unmentioned. Anyone who travels this route knows that this is truly miraculous and undoubtedly a good sign. My destination was the Holiday Inn Austin Midtown to meet with other United Methodist Women and Texas Impact for the 25th annual Legislative Event. We learned that 190 of us registered and of those there were 69 Newbies!!! That is very exciting! To add to our joy, I have to say that the increased number of young women attending was so uplifting and encouraging. They were a vocal and energetic group and a delight to have in our midst. They listened and contributed in a very meaningful way to discussions of some very heavy legislative issues. After listening and learning on Sunday and Monday, we met as UMW conferences- 6 of them- to caucus and reach consensus on THREE legislative priorities for our conference. There were 42 women in the Central Texas Conference, led by our Social Action Coordinator, Rebecca Lucas. She successfully moderated a brainstorming of issues that we felt were key, helped us narrow our selection to three, and then craft statements about what we hoped our legislators will do during this session to address those issues. Following our Conference Caucuses, the 6 Social Action Chairs met to combine the results of caucusing and develop the final 2017 Texas UMW Legislative Priorities. You can find those by going to http://texasimpact.org/UMW . That evening I honed a new skill I learned that day- using Twitter. I searched for the representatives I was assigned to visit and learned a little about them- their campaign platforms, personal interests, hot topics, home towns, and favorite sports teams. Then I fell into bed for a much needed sleep before a way too early get up time to allow for breakfast before getting on the bus at 7 AM! Armed with our pink page of legislative priorities, a list of legislators to visit, a cheat sheet that revealed some of their interests and previous votes in support of UMW priorities, and a map of the big pink building, we boarded the buses for the trip through Austin traffic to the Capitol. One cannot help but be impressed as you turn the corner to see that big pink building. It is pretty awe-inspiring. We met for a pep talk with long time supporter and UMW cheerleader, Representative Donna Howard. She sent us on our way as optimistic as possible. As you walk into the halls of the Capitol, for the first, second, third, or in my case, fourth time, the feeling is always a bit overwhelming. The first hurdle is simply figuring out where you are going, which direction you are supposed to turn, which elevator will actually go to the wing that you need, and which labyrinthine hallway is the right one to take. It can be pretty daunting. It made me wish for a GPS or an APP for that!! But, I made it, and happily all three of my representatives were on the same floor, in the same wing on two parallel halls. AND, there was a bench nearby that was comfortable enough for sitting to write thank you notes and legislative visit evaluations between visits. Visiting legislators is to be highly recommended as an exercise in courage and character building! Not to mention that it can be very empowering and encouraging. Here are a couple of nuggets I came away with. First, your representative needs to hear from you. They have an enormous log of bills to read and make decisions about. If there is a bill that you care about -even a little bit- you should share your opinion. Emails matter. Phone calls matter. Letters matter. They get categorized and counted. They can be used to defend a difficult decision you support that is unpopular with a vocal minority back home. If you don’t know the contact information for your legislators, check here http://www.fyi.legis.state.tx.us/Home.aspx . Most Legislators have a local office and staff. Go visit. Get to know the staff and help them get to know you and your priorities. Finally, remember that all of this takes time. Sometimes the process will take more than one session. Sometimes good happens incrementally. Be patient and persistent. Be informed, be involved, and be an influence for good for women, children and youth at the legislature.